We started out the new gregorian year with a fun and safe patrol of the Harlem River, Bronx Kill and small part of the East River. 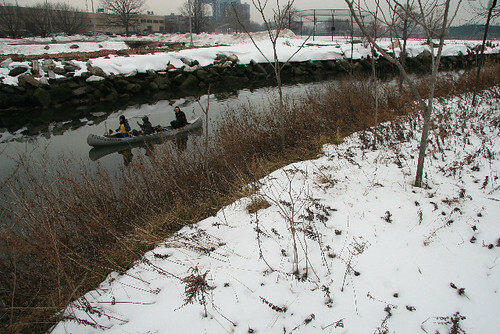 It was a warm January 1st, but with the snow still along the banks, especially along the lovely coast of Randall’s Island. On the Bronx side of the Kill we saw a pheasant flying thru this special Nature corridor. Also, due to the low tide we were able to see a number of seemingly unofficial pipes discharging from Randall’s Island. In addition, the Con Ed Electric cable that is a navigational obstacle with the right tide has a crumbled foundation. The metal holding it up has rotted entirely. Please contact NYCDOT and explain that this structure is now an imminent danger and needs to be removed. Click here to contact the Commissioner.